For the first time, the IMF laid out exactly what it views as appropriate taxes on coal, natural gas, gasoline and diesel in 156 countries to factor in the fuels' overall costs, which include carbon dioxide emissions, air pollution, congestion and traffic accidents. 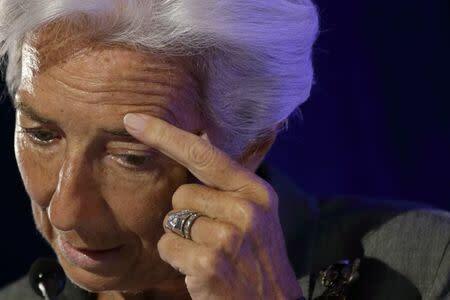 Under its chief, Christine Lagarde, the IMF has delved into the impact of climate change, arguing that tackling the fund's core mission of economic instability is impossible without also addressing environmental damage. At the book's launch in Washington, Lagarde said countries should not have to wait for global agreement on climate policies, and instead should move ahead in adjusting energy prices on their own. Nations are now working on a United Nations deal for late 2015 to rein in greenhouse gas emissions that have hit repeated highs this century, but progress has been slow as nations fret about the impact any measures could have on economic growth. The IMF's book argues higher energy taxes should not hurt growth if done right. "On this point, let me be crystal clear: we are generally talking about smarter taxes rather than higher taxes," Lagarde said, according to prepared remarks for the launch of the book. She said higher energy taxes are the most efficient and simple way of dealing with environmental harm and would allow governments to stop relying on a "patchwork" of other uncoordinated policies to deal with climate change, such as subsidies for renewable energy. Higher energy prices would prompt people to shift to cleaner fuels or more fuel-efficient vehicles on their own, Lagarde said, adding that they could also allow governments to lower other taxes on consumption or income to reduce the burden on people, or pay down more public debt. The IMF estimates implementing efficient energy taxes would reduce deaths from fossil fuels by 63 percent, cut carbon emissions by 23 percent, and raise revenues by 2.6 percent of GDP for the world as a whole. The IMF has made a big push in recent years for countries to rein in energy subsidies, which it says hurt the environment while rarely helping the most vulnerable and eating up valuable government funds that could be put to better use elsewhere. "But we need to go well beyond the elimination of direct cash subsidies, and make sure that energy tax systems around the world properly reflect environmental side effects," Lagarde said in prepared remarks for the event on Thursday.